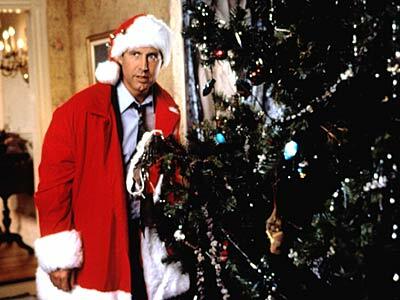 This is the time of year that a lot of Christmas movies are shown on almost every television outlet known to humanity. Of course there are many that are absolutely timeless such as Miracle on 34th Street, White Christmas, Dickens’ A Christmas Carol and its derivatives and It’s a Wonderful Life. There are also ones of various religious themes, usually involving the birth of Jesus, like no duh, it’s Christmas. Unfortunately most of these films as classic as they are bore me to tears. Yes they have nice messages and tug at the heartstrings but without wanting to sound too much like Scrooge I get bored by them, frightfully bored. I guess part of this is a generational thing. The ones set in the 1930s and 1940s are from a different era, an era that I know from history books and family members but not something that is a part of my life. It’s like the film The Bell’s of Saint Mary’s is about the Roman Catholic Church of a half century ago, not the one that I know or that exists now. They are fictional and while touching are indelibly tied to their time. The religious themed films tended often to be major productions of the Hollywood Gospel genre, not very faithful to Scripture or the teachings of the church, not that there is anything wrong with that. But it is certain to me that Cecil B. De Mille did not write the 5th Gospel, or the 6th Book of Moses (You have to know your Luther Bible for that one) thus I have a hard time with films that use the nativity or for that matter the passion of Christ for a quick buck. However, every year, there are several Christmas movies and television shows that I cannot live without seeing. Of the television shows my all time favorite is A Charlie Brown Christmas and How the Grinch Stole Christmas. As a kid I had a deep affinity for both Charlie Brown and Linus. The frustration of Charlie Brown with the commercialization of Christmas was something that resonated in me at a young age and still does today. If you want to see this just look at my articles on Black Friday. Likewise Linus’ reading of the Luke’s account of the Angel’s message to the shepherds always brings tears to my eyes. There is something about the sensitivity of Linus to the actual Gospel message that resonates in my heart. As for the Grinch, and I mean the television Grinch where Boris Karloff voiced the part of the Grinch not the Jim Carey movie version, it has always been a favorite of mine. 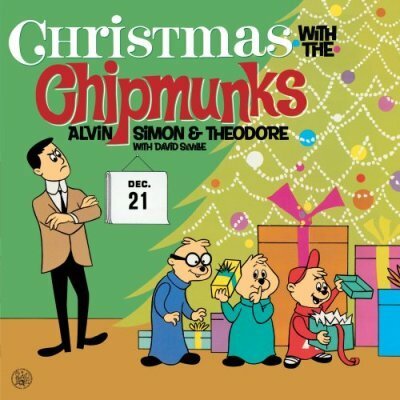 I find the plot of the Grinch to steal Christmas from the Whos of Whoville to be a masterful account of how the message of Christmas can touch even the smallest and coldest of hearts. Of course I absolutely loved the Grinch’s dog “Max” a dog whose loyalty to the Grinch reminds me of my dog Molly. 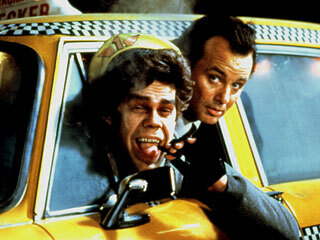 As far as movies are concerned I watch Scrooged staring Bill Murray and National Lampoon’s Christmas Vacation staring Chevy Chase with almost a religious reverence every year. I relate to the main characters in both movies. That’s not necessarily a compliment to me. Bill Murray’s Character in Scrooged pricks my cynical nature and there are times that I almost need to cover my eyes when in Christmas Vacation where Clark Griswold kicks the decorative reindeer and sleigh across the lawn when he can’t get his house lights on. His rants when his Christmas Tree goes up in flames and when his family tries to leave the house are so close to the way that I can act under the stress of the holidays that is scary. Since Judy says this is the case I know that I am not imagining this. Three other films that get me are Home Alone and A Christmas Story and though it is not really a Christmas story Trading Places staring Dan Aykroyd whose Christmas season meltdown is at the center of a film about the greed of certain parts of the American financial sector. These are what I grew up with and which were the films about Christmas as it takes place in the United States that I became an adult in that typify my era, not that of my grandparents. I think that is why they are my favorites and not the classics of a bygone time. Of course there is the Festivus episode of Seinfeld that is almost scary because of how close to home it hits. There are times that I think we only lacked the “feats of strength” and the Festivus Pole to complete the picture. 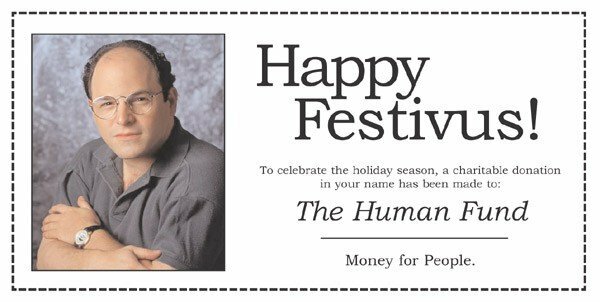 Sticking to Seinfeld I always feel a twinge of sympathy for George when makes up a fake charity called “The Human Fund: Money for People” to give to his co-workers at Kruger Industrial Smoothing. There are times that I am tempted, but thankfully never will do something similar. 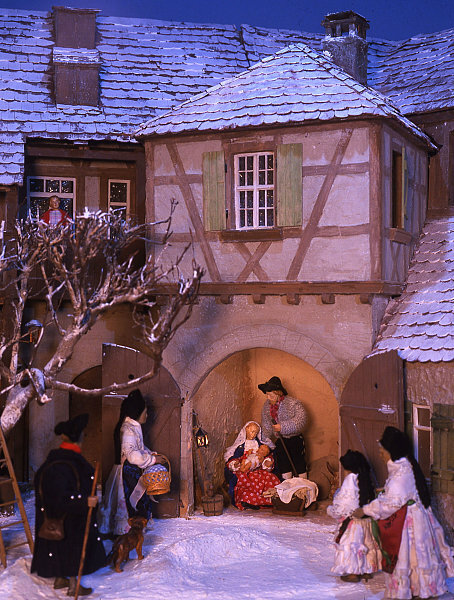 When Christmas comes and you struggle with faith, see little hope and even despair of life, even the thought of Christmas coming can make the season even more difficult. I know, I have gone through this since my return from Iraq. Christmas 2008 was so frightful due to PTSD symptoms, insomnia, anxiety, depression and a crisis in faith that I could see little to hope in. It was so difficult that before Mass began at the Abbess’s parish that I couldn’t stay. I walked home in the cold and dark, not directly home but the long way looking up at the heavens and wondering if God was even there. For the first time in my life I could really relate to Charlie Brown. That as I have mentioned before was actually a terrifying thought. Even in the darkest of times in seminary I never lost hope and always felt something special at Christmas. In Iraq in 2007 I felt an incredible closeness to God as I traveled about to my advisers along the Iraqi-Syrian border having the chance to celebrate Christmas Eve and Christmas Eucharist and spend time with our guys and distributing toys, school supplies and cold weather clothing to Bedouin families who invited us in for Ch’ai tea and food. But in 2008 faith was dry and hope, well hope was something that I prayed for as I walked home that Christmas Eve. This year has been one of ups and downs but I have noticed that I have been feeling better the past few weeks. Yes I still have problems sleeping but I am actually trying to get to bed earlier but I still have my struggles with faith and God but unlike last year I am looking forward to the celebration of Christ’s Incarnation. The message of “Emmanuel, God with Us” is something that I find resonating again. Maybe it was in that moment a couple of weeks back where I was on call and ended up having the blessing of doing an anointing, or “last rites” of a retired Navy doctor who had done his internship at my hospital and having the experience of having him breathe his last as I completed the rites. There was something miraculous about that man, his life and faith that allowed the Deity Herself to somehow let me be on call and respond with exactly what he desired in his final moments on this earth. Maybe it was running into a lady who had spent two months in our ICU earlier in the year. At numerous times her condition was so critical that it appeared that she would die. However she spotted me is I was filling my cup of water and ice in the hospital food court and pulled me aside. She was doing great and thanked me for being there for her. Then there were other times where I was able to get outside of my problems and be part of other people’s lives, many times those who are critically ill like Sadie Harrell who on her death bed took the time to bless those around her, give directions to her family and before asking for more pain medications telling me that it was time to pray. I could give the accounts of numerous people, staff and patients at our hospital as well as people at church, friends that I have known for years and people that I have gotten to know through this website and Facebook as well as my friends at the Church of Baseball, Harbor Park Parish and Gordon Biersch. Some of those have been through responses of people to what I write on this website. A few days ago I heard from the son of my ROTC training NCO Master Sergeant Harry Zilkan who passed away a few years back. I talked about Sergeant “Z” in my post “Remembering the Veterans in my Life.” I was honored to hear from him and hear how much he appreciated what I said about his dad. When I started this site back in February I saw it as an outlet for me, and that it has been, at the same time I find that there are people very much like me who have walked in similar shoes who have been blessed by what I write. This is actually quite humbling. Like I said this year has been different. I still have a hard time with prayer though extemporaneous prayer on the behalf of others is becoming relatively normal again even if I still have not been able to resume my regular prayers of the Daily Office which died during Lent because they had become rote and were more of a duty than a part of life. I had never expected that, but I think I will use the Nativity to begin again. This has been a year of transition as I have struggled with a crisis of faith, the seeming absence of God, PTSD, anger, depression and anxiety the condition of my father with his Alzheimer’s disease and problems dealing with my mother. Likewise, I find that the feeling of being vulnerable, weak and the pain of having to deal with all of those emotions for the first time that I can remember is not where I want to be, but does give me empathy for those who have lived with these feelings for years. In a sense I have began to be part of that community. At the same time despite all of this that faith is returning and I can sense hope again. Even the Scriptures for the season and the songs and carols are touching me again. The sense of tradition in the liturgy at church has been good for me since beginning to attend Saint James Episcopal Church in Portsmouth. I am finally beginning to hope again. Tonight I will be at Saint James even as the Abbess sings at the 5 PM Mass at her parish. I am looking forward to the Mass tonight. I do pray that whatever you are doing tonight and regardless of whether you are a Christian or not that you will know joy, peace and the presence of God this season. I think of the Jewish physicians at the Medical Center who are covering today and tomorrow to allow their Christian colleagues to attend services and be with their families. God bless you guys, you’re the best! As I said yesterday, Merry Christmas or whatever you do. As far as movies I have watched “Scrooged” and “National Lampoon’s Christmas Vacation” almost religiously and am doing so tonight. I relate to both of the main characters in both movies. That’s not necessarily a compliment to me, but when I watch both there are times that I almost need to cover my eyes because of the resemblance, especially the scene in Christmas Vacation” where Clark Griswold, played by Chevy Chase starts kicking his decorative reindeer and sleigh across the lawn when he can’t get his house lights on and his rants about when his Christmas Tree goes up in flames and when his family tries to leave are scary close to the way that I can act under the stress of the holidays. The Abbess says that this indeed is me and I agree. Three other films that get me are “Home Alone” and “A Christmas Story” and though not really a Christmas story “Trading Places.” These are what I grew up with and which were the films about Christmas as it takes place in the United States that I became an adult in that typify my era, not that of my grandparents. I think that is why they are my favorites and not the classics of a bygone time. Of course there is the “Festivus” episode of “Seinfeld” that is almost scary in how things were in my house with my folks, I think at times we only lacked the “feats of strength” and the Festivus Pole to complete the picture. Likewise when George makes up a fake charity called “The Human Fund: Money for People” to give to the folks at Kruger Industrial Smoothing it cracks me up because I know that there are people who give gifts in other people’s names to charity. Finally I like the “X-Files” Christmas episode where Ed Asner and Lilly Tomlin played ghosts in a haunted house that Agents Scully and Mulder get trapped in while investigating a case. 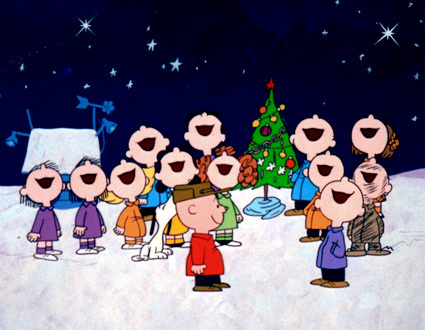 Okay, so these are not the classics of a bygone era, but they are my classics and I will enjoy Charlie Brown, Linus, the Grinch, Clark Griswold, Frank Cross, the Costanzas and the rest of my warped favorites as I rediscover Christmas.